An artist's illustration expression of how a large meteorite impact in the sea might have looked in the first second of the impact. Scientists are unsure if the oldest meteorite crater on Earth, a 3 billion-year-old crater in West Greenland, was actually covered in water at the time. Image released June 28, 2012. The world's oldest meteorite crater —a giant impact zone more than 62 miles wide — has been found in Greenland, scientists say. Scientists think it was formed 3 billion years ago by a meteorite 19 miles (30 kilometer) wide — which, if it hit Earth today, would wipe out all higher life. The crater is so wide that it would reach the edge of space 62 miles (100 km) above Earth if stood on end. The crater was "discovered" at an office in Copenhagen by scientist Adam Garde as he pored over maps showing nickel and platinum abundance in the target region of West Greenland. Garde, a senior research scientist with the Geological Survey of Denmark and Greenland, saw a both simple and extreme explanation for several strange geological features in this region: an impact from a meteorite that may have contained valuable metals. The black circle on map shows the location of the meteorite impact structure near the town Maniitsoq in Greenland. Image released June 28, 2012. A research team following up on Garde's research collected samples in 2011 that support his hypothesis, and the results are published in the journal Earth and Planetary Science Letters. In the 3 billion years that have elapsed since the impact, the land has been eroded down to about 16 miles (25 km) below the original surface, and has lately also been carved and excavated by the Greenland ice sheet. All external parts of the impact structure have thus long gone, but the effects of the intense impact shock wave penetrated deep into the interior of the Earth and these remain visible today, according to the study. About 180 impact craters have been discovered on Earth, and nearly one third of them contain significant minerals deposits like precious metals. A Canadian mining company, North American Nickel, is currently exploring the region, called Maniitsoq, for minerals. "This single discovery means that we can study the effects of cratering on the Earth nearly a billion years further back in time than was possible before," McDonald said. Before this discovery, the oldest crater was thought to be 2 billion years old, and 186 miles wide (300 km), located in South Africa. 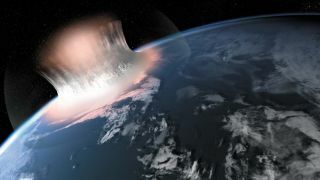 Scientists suspect that there were many more craters formed around 3 billion to 4 billion years ago when Earth lacked a protective atmosphere, although the vast majority of these have been destroyed by erosion, plate tectonics and other processes. This story was provided by SPACE.com sister site OurAmazingPlanet. Get the latest in Earth science and exploration news on Twitter @OAPlanet. We're also on Facebook and Google+.